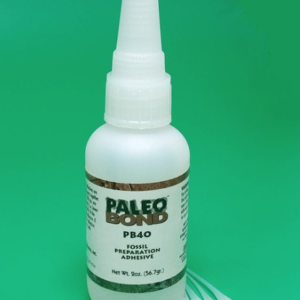 PB002 PENETRANT STABILIZER is the workhorse of the PaleoBOND family. 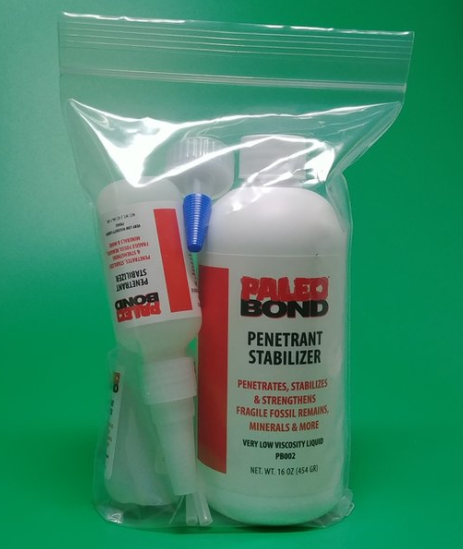 Penetrant Stabilizer acts as a PRIMER for all other PaleoBOND adhesives to achieve maximum bond strength. With a very low viscosity of almost zero, it penetrates deep into the vascular system of a fossil bone, mineral, petrified wood or other substrate. 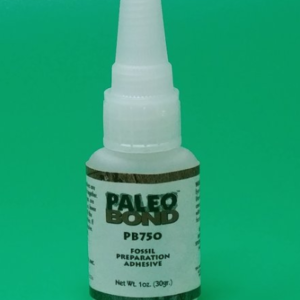 PB002 fills micro cracks by capillary action, flowing into the narrow spaces and pores of a fossil, mineral, etc. stabilizing and strengthening the entire specimen upon curing. 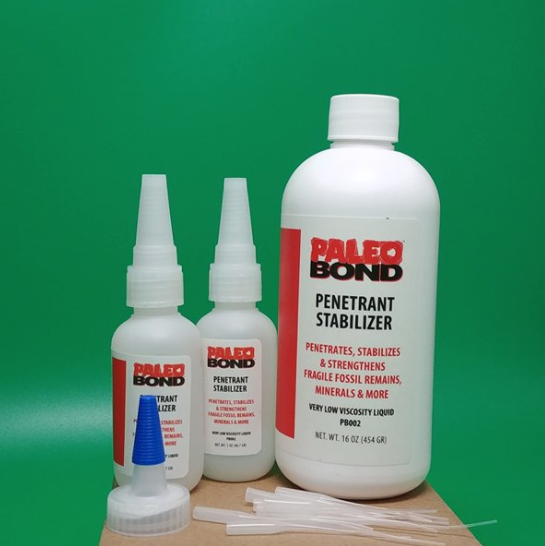 Penetrant Stabilizer captures punky, weak fossil, wood or mineral material and hardens it in minutes. 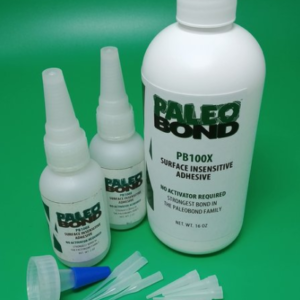 This product will become your favorite adhesive tool! 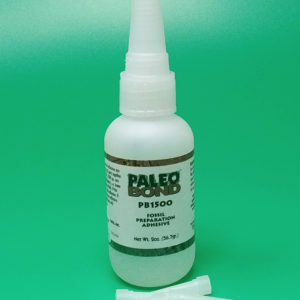 The internal and external condition of a fossil bone surface or mineral cache can be a frustrating challenge. Mother Nature kind of ignored the quality of preservation on some of the fossils and minerals and we have to try and correct her failings. PB002 just may become your best tool out in the field. It hardens the fragile remains in-situ so you can remove the fossil or mineral without further damage. Make sure that all matrix is clear from any specimens you treat in the field. It’s quite difficult to remove the matrix once you’ve put PB002 on it. If you need to do further prep back in your shop or lab, PB4417 or PB4418 is a better field option, as it can be mechanically removed with your tools. If you have any Pyrite disease, just apply PB002 to stop any further oxidation. PB002 seals and stabilizes the specimen. The Kit includes: One 16 oz. bottle of Penetrant Stabilizer PB002-16 with yorker, 10 microtips and two empty 2 oz. bottles.